As quality control continues to be our top priority, the need for destructive testing of plated parts has increased. The most common test is called a Salt Spray Test. This test measures the plating’s corrosion protection potential. This test is known as accelerated corrosion test. 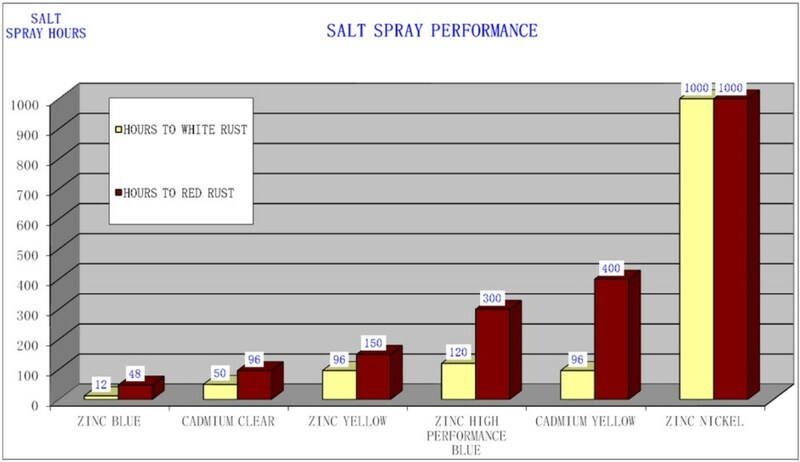 The Salt Spray Test uses a 5% salt solution dissolved in water that is sprayed over the parts in a closed cabinet. The parts are checked daily and visually inspected. The test is to first measure how well the chromate (color) protects the plating deposit. This is how many hours it takes to wear through the chromate, which causes the Zinc or Cadmium to rust and form its characteristic white rust. This is reported as hours to white corrosion products (rust). The next step is to continue the salt spray test until there is red rust noticeable, which means that the plating has given way and allowed the part itself to corrode. Iron corrodes with red corrosion products and is reported as hours to red corrosion rust. The better the chromate the longer is takes to see white corrosion. Red corrosion is slowed down by the plated metal and it’s thickness. Different metals offer different levels of corrosion protection. Our Zinc-Nickel Alloy Plating is by far the best plating around. This is a time-lapse video comparing typical zinc plating found on most fasteners and our Zinc-Nickel Alloy Plating. As you can see the results are dramatic. As you can see it can be complicated to determine what type of plating will pass your customers requirements. The best way is to consult with BPS to determine what type of plating and thickness and chromate type would be best. The only way to know for certain is to test the parts.